Here we are in midsummer and before we know it our Grange year will be over. Have you looked over your CWA Report Form to see if you've met all the requirements for your Certificate of Excellence? Reports are due by September 1st. Please send one copy to Betty-Jane and one copy to your Pomona Chairman. We've heard from several sources that the Baby Shower for Covenant to Care has been very popular in many of the Granges so we're really looking forward to seeing the results of this project at State Session in October. Things will be done a bit differently this year. Our CWA yearly presentations and awards will be given at the luncheon on Friday. I hope many of you will be able to attend. Also, don't forget the Foster Children. We're collecting some of the items we've asked for in recent years - comfy covers, Christmas stockings with small gifts, school supplies, memory books, gift cards for kids, etc. We're hoping for a nice selection of things for them. 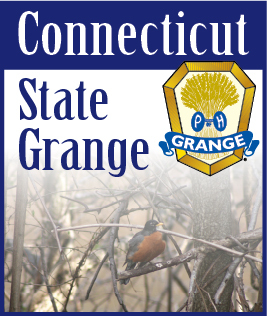 Have you or anyone in your Grange made something for sale at the New England Grange Building Country Store? Any kind of item is welcome as long as it is handmade. They are not allowed to sell commercial items in the store. Help will also be needed in the building so if you'd like to volunteer call Betty-Jane. You'll get tickets and a parking pass and you can enjoy part of the day on the grounds as you wish. Have a fun rest-of-the-summer and I'll see you at one or more of our events.